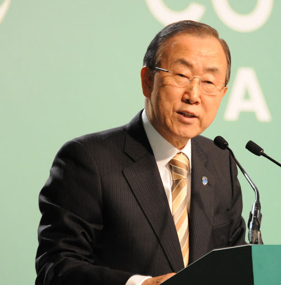 UN Secretary-General Ban Ki-moon briefed UN Member States on the status of global climate change negotiations. He discussed progress made at recent meetings of the UN Framework Convention on Climate Change (UNFCCC), and said a few key issues remain to be decided, including climate finance, adaptation and resilience, and accelerating action. 23 February 2015: UN Secretary-General Ban Ki-moon briefed UN Member States on the status of global climate change negotiations. He discussed progress made at recent meetings of the UN Framework Convention on Climate Change (UNFCCC), and said a few key issues remain to be decided, including climate finance, adaptation and resilience, and accelerating action. Speaking on 23 February 2015, at UN Headquarters in New York, US, Ban discussed the outcomes of the 20th session of the Conference of the Parties (COP 20) in Lima, Peru, as well as the agreement reached at the Geneva Climate Change Conference, on a negotiating text for the 21st session of the Conference of the Parties (COP 21), which is scheduled to take place in Paris, France, in December 2015. Ban also spoke of the successful results from the Climate Summit in September 2014. He noted that leaders from all sectors had demonstrated that they can be part of a climate solution during the Summit, and highlighted that leaders there had pledged to mobilize over $200 billion by the end of this year to finance low-carbon, climate-resilient growth. He also thanked all countries for their 2014 contribution pledges to the Green Climate Fund (GCF). Ban urged countries to prepare ambitious Intended Nationally Determined Contributions (INDCs) detailing their proposed actions to address climate change. UN General Assembly President Sam Kutesa said Parties’ agreement on the ‘Lima Call for Climate Action’ and a draft text negotiating document “paves the way for a new, ambitious and universally-binding climate agreement to be adopted at COP 21 in Paris.” He called for political will that is “strong and sustained” in the lead up to COP 21, to build on the constructive spirit present in Lima and Geneva. Kutesa also said the climate change negotiations must be mutually reinforcing with other ongoing UN processes, including the negotiations on a post-2015 development agenda, financing for development (FfD), and disaster risk reduction.